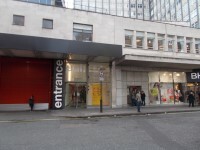 London College of Fashion is a world leader in fashion design, media and business education. In boundary-pushing research: where fashion intersects with science, engineering, technology. And in enterprise: where we partner with top brands and help launch exciting new businesses. We have been nurturing creative talent for over a century, offering courses in all things fashion. Across every subject, we encourage our students to examine the past and challenge the present. To have their own ideas. And we give them the skills, opportunities – and above all, the freedom – to put those ideas into practice. With our support, students find their own styles and voices. Then use them to improve the way we live, and transform the future.